This is how my life works now. 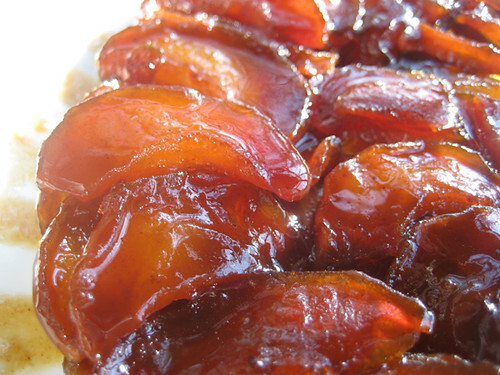 I read about tarte tatin at one blogger’s site. So I go to Green City Market and wind up buying the apples for it from another blogger. 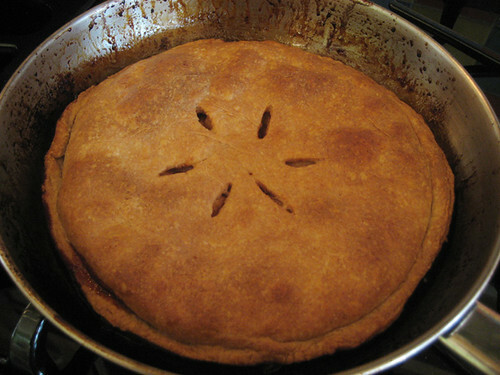 Ruhlman made it sound good and easy, so I found a recipe for it in (another blogger) Rose Levy Beranbaum’s Pie and Pastry Bible. I knew I was going to make an apple run Wednesday because I had made a terrific apple pie using Mutsu apples, so I wanted to stock up on a few of them and cut them up for pie and vacuum seal/freeze them. Although I grant you that Honey Crisps are damned tasty apples, and it’s no mystery why they’re the apple of the moment, I also think of them as the tramps of apples, easy and obvious in their sugared-up appeal, their in-your-face 44DD flavor. Instead I looked over the other apples and two Charlie Brownish varieties (small, irregular, bumpy, a little sad-looking) caught my eye. Of course I can’t remember their names, now, but they were both old varieties. 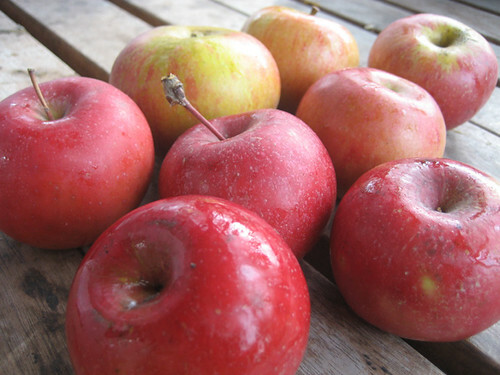 The goldish ones were especially pretty; I just ate one and it wasn’t complex but had a nice astringent apple-juiciness, like apples used to taste before that brazen hussy Honey Crisp came along. The reddish ones screamed pie and were said to be good for that, by Fruit Slinger himself (who I had talked to many times, but never until yesterday actually talked about being a fellow food media outlet with). It was a gray drizzly day, nearly over for him, and he looked very ready for it to be over, but he did give me his imprimatur on my choices and purposes for apples, so I felt blog-approved in my purchases. 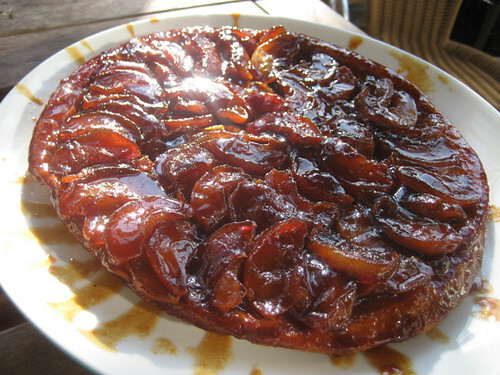 Anyway, so here’s the gist of tarte tatin. 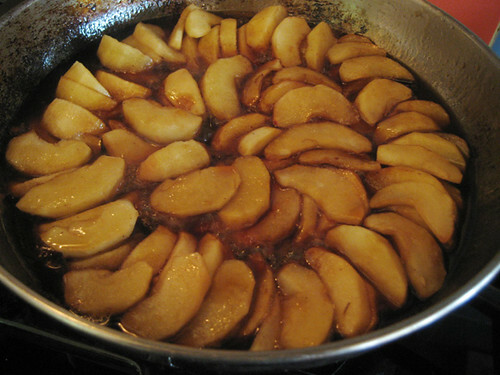 Make some caramel with butter and the juice that dripped off of your apple slices as they sat in sugar and lemon for half an hour. Arrange the slices as neatly as you can in rings. Cook, basting frequently, till the caramel is nice and thick. Let cool a bit and fit a crust over it. Bake. Flip like a Spanish tortilla (plate over pan, one firm decisive flip, listen for plop). Fix any egregious spots while still warm and wet. Let cool and harden. Take another picture, it’s so pretty. It was very good, accompanied by (instead of Ruhlman’s creme fraiche) Scooter’s custard, although as a dish I’d still rank it second to a first-rate American apple pie, or the apple tart with apricot marmalade and custard I make from this book. Here’s yet another blogger, suggesting something else to do with apples from Green City in a nice little video she made. Who knows, I’ve probably seen her there, too. Life’s like that.